Dr. Clarence E. McPherson is committed to raising up Kingdom leaders who know God personally, live His purpose for their lives, and experience His divine provision in overflowing measure to advance the Kingdom of God. Dr. McPherson earned a Bachelor of Arts degree from Grace College of the Bible in Biblical and Pastoral Studies. At Grace, Dr. McPherson won 1st place in the Don Crawford Homiletical Preaching Award Series, focusing on expository teaching and preaching. Dr. McPherson is a recognized scholar in New Testament Greek and, while at Grace, was given the American Bible Society's Award for outstanding Greek and Biblical Studies. He graduated as President of the Senior Class. He earned a Master of Arts degree from Regent University in Biblical Studies and Pastoral Ministry. Dr. McPherson attended Regent University as a Beazley Scholar, recognized for his academic excellence and servant leadership. He earned his Ph.D. in 2008 from Regent University in organizational leadership, where he obtained dissertational research expertise in motivational gifts, person job-fit, and job satisfaction. Dr. Clarence E. McPherson is the author of Highest Priority and How to Break the Poverty Syndrome. He has conducted leadership training and ministered internationally in the United States, Israel, Singapore, Malaysia, and Nigeria. Dr. McPherson is the founding senior pastor of Turning Point Church, in Virginia Beach, Virginia, (formerly Agapae International Church) where he has served for 25 years. 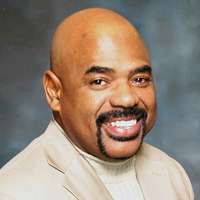 Dr. McPherson has additionally hosted the dynamic television program entitled Day of Destiny. He currently resides in Virginia Beach, Virginia with his wife Sharon, a distinguished career public educator and their son Ethan. God joined the human race in order to redeem it. He elevated the human race to a place it had never been before. He who created us is now one of us. Now there is a man in the Godhead just as there is God in the human race. One of God is a human.